Cut flower production has a long and distinguished history. Roses, carnations, and chrysanthemums have been cultivated for centuries in many parts of the world. These popular garden flowers are enshrined in literature and the arts. Gardeners would cut and bring these and other flowers into the home. In the 1600 and 1700’s formal cut flower production became established in The Netherlands with the development of greenhouses. Spring flowers were brought into bloom early in the winter. In particular, lilac bushes were dug out of the field in the fall, subjected to natural cold temperatures to break dormancy and forced in greenhouses. 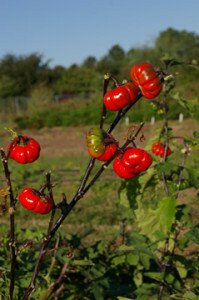 The cut stems were then harvested and sold. Cut flower producers in the United States quickly followed European settlement, with the first greenhouses reported in the mid to late 1700’s. Small producers were located near cities and towns to supply the populace with cut flowers. At that time transportation was slow and lacked refrigeration. With the spread of Europeans across the continent, cut flower production moved with them. 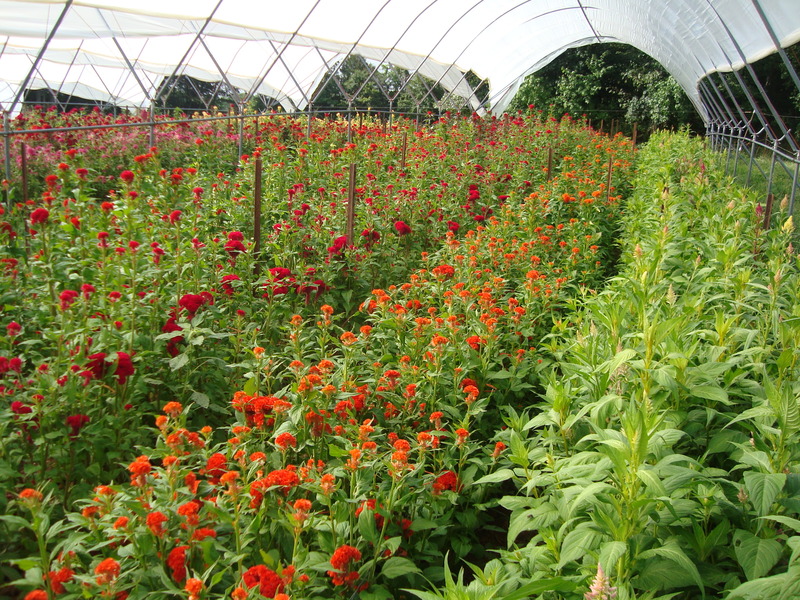 Production was not limited to greenhouses as there was also some harvest from outdoor grown crops. The development of air transport and refrigerated trucks greatly accelerated the concentration of the cut flower industry and allowed it to move to areas with the best climates for optimum production and lower production costs. Carnation and rose production moved to the Colorado mountains and then to coastal California. 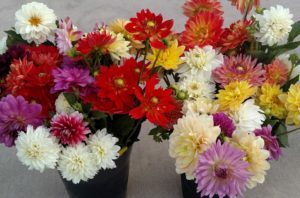 Chrysanthemum and gladiolus production moved to Florida and California. Northern growers stopped growing many of their traditional greenhouse crops. Field production at this time was declining, except with a few species such as gladiolus. California eventually dominated the fresh cut flower industry in the United States. Relocation of the cut flower industry did not stop with the move to California. Cut flowers could be imported from other countries because cut stems did not have roots or soil, which had restricted import of other floriculture crops such as plugs and potted plants. In the mid 1960’s the first carnation production started in Bogotá, Colombia. The industry rapidly increased because of the excellent climatic conditions – high light, moderate temperatures, and very low production costs, especially labor and heat. 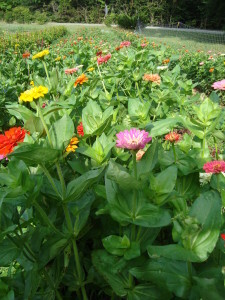 The production of chrysanthemums and roses followed in later years. Other countries followed suit, especially Ecuador, but none have been as successful as Colombia. Today, the majority of all three species sold in the United States are imported. The rapid increase in imported flowers had a devastating impact on cut flower production in the United States as the majority of the carnation, chrysanthemum and rose producers shut down or converted to other crops, such as potted and bedding plants. A number of large producers still remain by focusing on a broad range of crops. As the cliché goes, “when one door closes, another opens”. The loss of many large scale producers provided niches for small local producers to compete. They could provide high quality flowers which have never been boxed and shipped dry. They especially focused on flowers that do not ship well. At the same time during the 1990’s retailers and consumers increasingly wanted more choices than just a few species. The classic “roundy moundy’ rose, carnation, and chrysanthemum arrangements weren’t enough for most consumers anymore. They wanted more interesting, less structured arrangements, mixed bouquets, and even vases filled with just one type of flower. They also wanted to see new and unusual flowers. Small producers resurged selling a broad range of cut flowers directly to consumers through farmers markets, roadside stands or even the occasional U-pick operation. Other growers targeted specialty florists, supermarkets and wholesalers. Much of the production is in the field, but growers also use an array of structures ranging from fully-controlled greenhouses to minimally heated hoop houses to unheated high tunnels. In 1989 the Association of Specialty Cut Flower Growers (www.ascfg.org) was formed by Alan Armitage and Judy Laushman to address the needs of the increasingly diverse cut flower industry in the United States. By the early 2000’s specialty cut flowers became the dominant force in US production, with lilies the number one crop. A list of cut flowers now grown in the United States is quite long, well over 100 species, and includes various types – cool season spring annuals, warm season summer annuals, perennials, woody trees and shrubs, grasses and grains, and even native plants harvested from the wild. The situation could not be better for consumers. Large amounts of modestly priced flowers are readily available, and they can choose from a staggering array of gorgeous flowers, foliages, stems, and fruits. All they have to do is look for them.